Inside and out, the revolutionary Prius has been completely redefined. Prius is equipped with standard convenience like heated front sport seats and automatic climate control. The 60/40 split rear seat also has a fold-down armrest for passenger comfort. Available features include SoftTex interior and a tilt/slide moonroof. Available on Prius Technology, the Advanced Package assembles features like SofTex seating, an 8-way power adjustable driver’s seat with lumbar support and rain-sensing wipers. It also comes with advanced safety features like: head-up display, blind spot monitor with rear cross traffic alert and intelligent clearance sonar with parking assist. 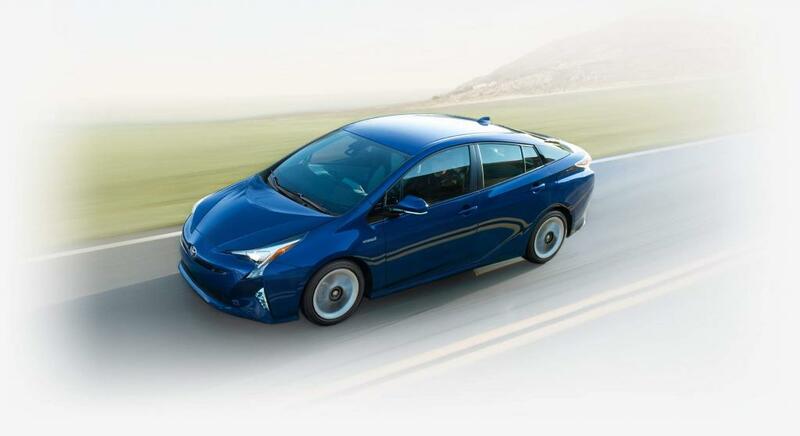 For optimal handling, fuel efficiency, and sporty good looks, Prius features a low slung stance, low rolling-resistance tires, a rear spoiler, a grille shutter, and Prius’s lowest co-efficient of drag ever (0.24). 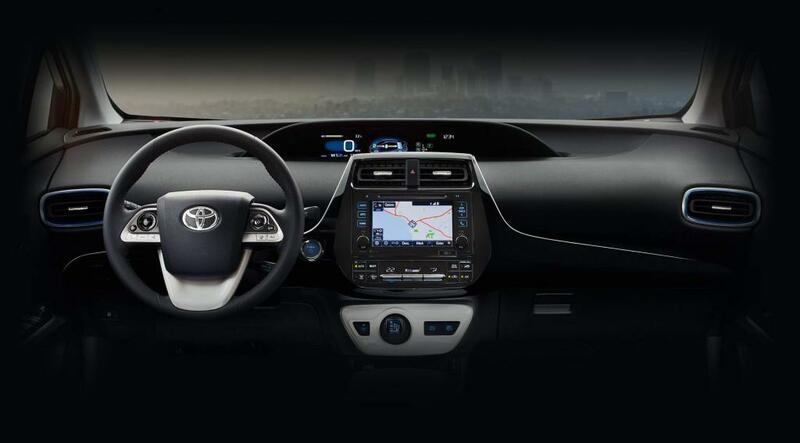 Prius’s 6.1” touchscreen audio system offers AM/FM/CD/MP3/WMA playback with steering wheel audio controls and SIRI® Eyes Free. Featuring 6 speakers, it also includes USB auxiliary input and Bluetooth® capability. The touchscreen also houses the backup camera display. 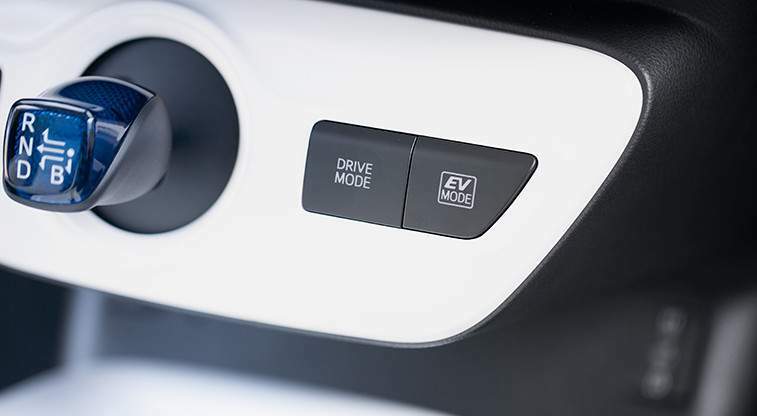 Get important info like fuel efficiency and trip data and whether you’re using gas or battery power at any given time. Eco Drive Monitor can even give you insight on your driving style and the impact it’s having on your fuel consumption. Wireless Charging is standard on both Prius Touring and Prius Technology and allows certain handheld devices to charge, simply by placing them directly on the wireless charging pad. Toyota’s signature drivetrain technology for hybrid vehicles seamlessly manages transitions between a 1.8 Litre, 4 cylinder engine and electric motor and continuously variable transmission, based on driving conditions. The system also outputs 121 Net horsepower. Prius owners very rarely have to replace the hybrid battery. They’re designed to last the life of the Prius and covered by an 8 year/160,000 km Hybrid Component Warranty. 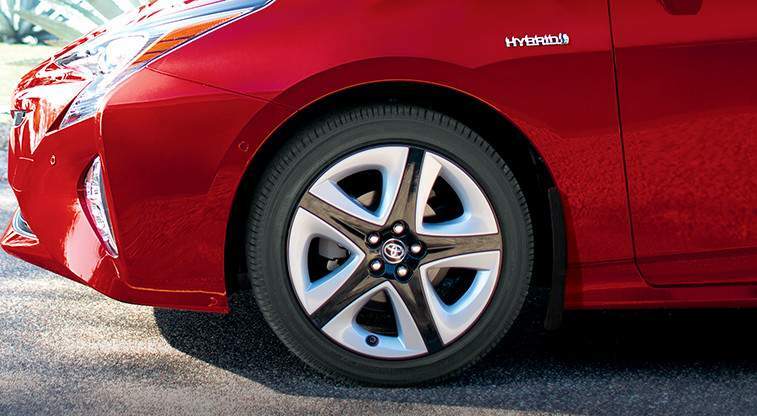 Prius recaptures excess energy from braking and reapplies that energy to recharge the battery. Your Prius never needs to be plugged in. 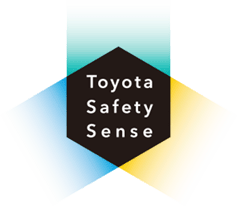 Toyota’s new Safety Sense system (TSS-P) includes a pre-collision avoidance system that assists in warning the driver of potential dangers, automatic high beams, a lane departure alert system, and dynamic radar cruise control. Found on the front passenger seat cushion, a driver’s side knee airbag, front and rear side curtains, and front-seat mounted side airbags.